Fein Optic provides high quality optics with a 6.7:1 zoom ratio. Viewing Head: 45° inclined viewing head rotates 360°. Interpupillary adjustment from 54mm - 76mm. Your choice of binocular or trinocular. 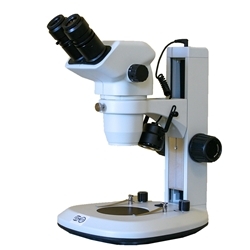 Trinocular microscope includes 0.5x c-mount adapter. When beam splitter is engaged light is split between left eyetube and trinocular port, while right eyetube goes dark. Eyepieces: Includes high eyepoint widefield 10x eyepieces, FN 22mm with +/-5 diopter adjustment on each eye. Included 10x eyepieces accept a 24mm diameter reticle. Optional 15x/16mm and 20x/12mm eyepieces are available for purchase below. Objectives: Zoom stereo 0.67x - 4.5x provides a zoom ratio of 6.7:1. Total Magnification: Zoom range of 6.7x - 45x when using included 10x eyepieces. View chart below for alternate options when using auxiliary lenses or alternate eyepieces. Working Distance: 100mm. Can be adjusted from 26mm - 200mm depending on auxiliary lens utilized. See magnification chart below. Specimen Stage: Includes 100mm glass stage plate and two stage clips. Stand: Track stand with transmitted and reflected LED illuminators.Top light has 15 LED lights. Vertical travel of 110mm. Includes dust cover. Illumination: Top & bottom LED illuminators with dual intensity control and on/off switches. Top LED light contains 15 individual LED lights. 100V~240V.